Canvas window awnings could be the best way to shade a few rooms in your home. They add beauty and elegance to your home and they are a sure way to increase your property value. You will also enjoy the money saving values of lower utility bills and longer lasting furniture, carpeting and drapes. 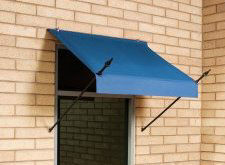 Below are a couple examples of the type of window awnings that can be ordered online. 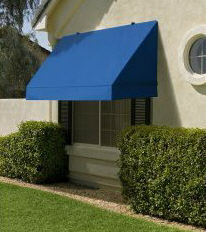 Stacks and Stacks carries a full line of canvas window awnings. These awnings are extremely durable and easy to maintain, they are made from an acrylic canvas that is water, mildew, and fade resistant. They are delivered fully assembled and ready for easy installation. They are equipped with a pulley kit for retractable convenience and are available in different colors and sizes. This is another selection from Stacks and Stacks. This unique style is also available in different colors and sizes. Installation for this type of canvas window awning is very easy. To find a canvas window awning contractor in your area try Home Advisor. The service is free and their goal is match home owners with prescreened and qualified contractors. For window awnings of all types, in Arizona, use our contact page, and get a free, no obligation, estimate. Just want to order one? Use this link. Watch the video below and learn more about the benefits of a window awning. The possible energy savings may surprise you.